The Gerrit Smith Estate National Historic Landmark will hold its third annual Holstein Heritage event at 2 p.m. on Sunday, June 3, the third day of Dairy Month, at the Smithfield Community Center, 5255 Pleasant Valley Road in Peterboro. Milton C. Sernett PhD will present Peterboro: Cradle of the Holstein Breed! 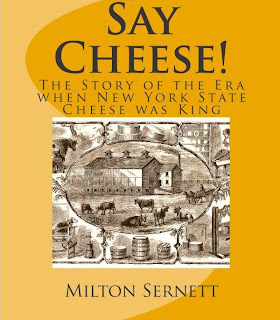 Sernett’s interest in the history behind the New York State Holstein Association monument on Oxbow Road just north of Peterboro gave impetus to this annual event recognizing the important role that Peterboro played in the agricultural industry. Returning directly from the National Association of Milk Bottle Collectors (NAMBC), Peter Bleiberg will share information on milk bottles and their collection. Bleiberg, a resident of New Hartford and the next editor of The Milk Route, the official newsletter of the NAMBC, has been collecting milk bottles for twenty-four years. He focuses his collection on the variety of pictures and slogans that began to appear on painted milk bottles in the mid-1930’s. To promote the use of their milk and other dairy products, dairies used images of cows, barns, babies, families, ice cream, butter, nursery rhymes, war-related scenes, and many other subjects on the backs of the colorful bottles. Peter’s presentation, entitled Marketing of Milk in the 1940s, includes pictures of hundreds of bottles and traces the advertising themes on the bottles that sat in our refrigerators and on our kitchen tables every morning. Mike Gleason will return to the annual event with his antique milking machines and, hopefully, with copies of his book on milking machines that is in publication at this time. The public is encouraged to attend this heritage session which broadens understanding of the rich history of Gerrit Smith and his family. The Gerrit Smith Estate National Historic Landmark at 5304 Oxbow Road in Peterboro has been designated by both the state and national park services as a site on the Underground Railroad. Exhibits on freedom seekers and abolitionists are in the three buildings on the estate that are open to the public. The site is open in 2012 on weekends from 1 -5 pm through September 23, for special events, and by appointment. Admission is $3 and free for students. For more information: 315-280-8828, info@gerritsmith.org or www.gerritsmith.org. Illustration: A Holstein from an 1898 print.